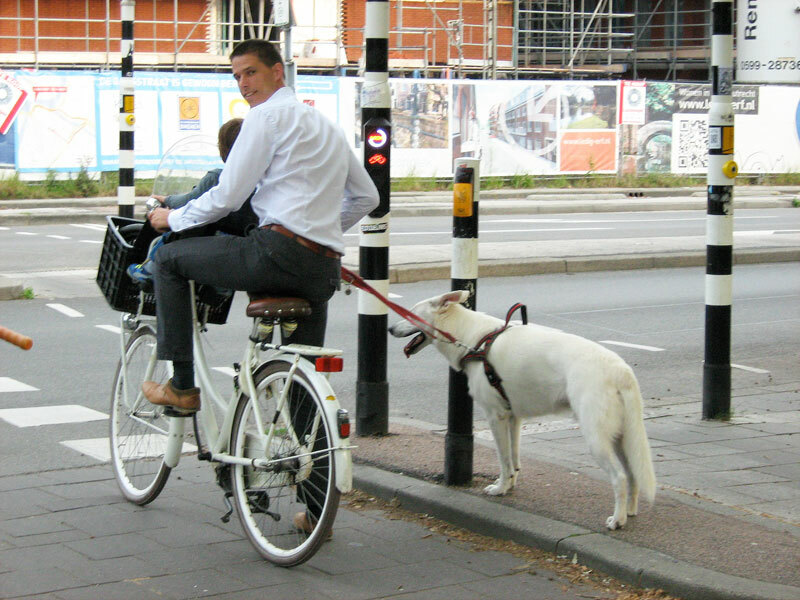 In the Netherlands, it’s quite common for people to take their dogs with them when riding their bike. 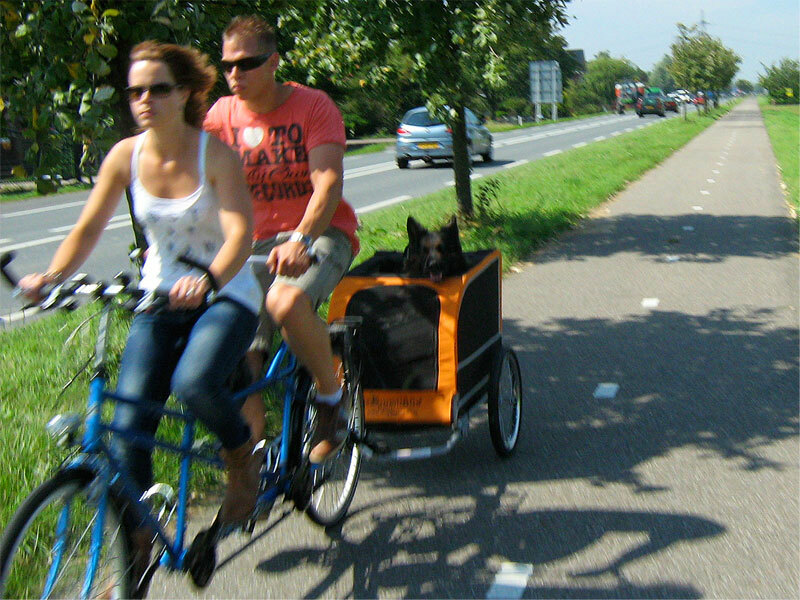 Either in a basket, a trailer, or scampering along beside, I’ve never seen such happy dogs as I saw in the Netherlands. Note that Super-Dad here also has his son in the child seat! Even the family dog can take part in the school run! 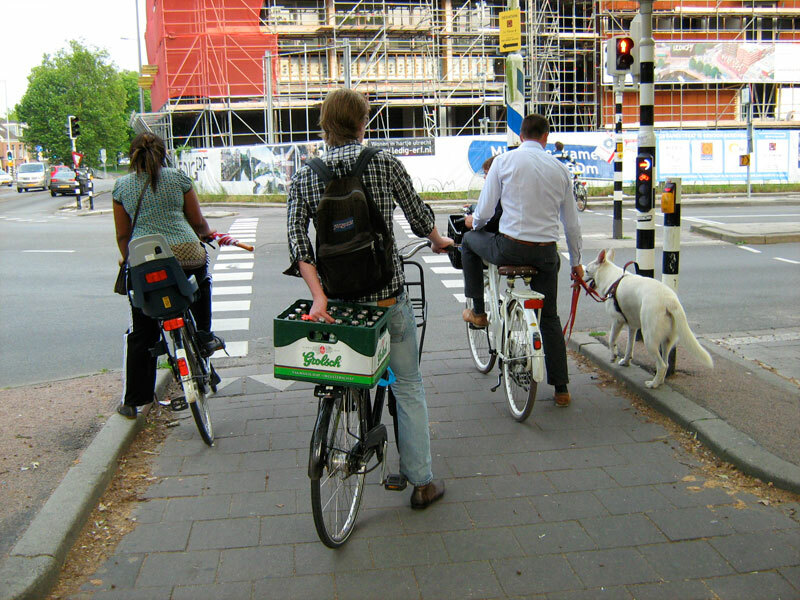 Actually, this is one element of Dutch cycling culture which I really can’t approve – although I also see enough of it around my home in Surrey. People who know about dogs, like vets and dog trainers, will tell you that making a dog run alongside a bicycle is cruel. Dogs don’t go walkies for exercise, they go out on patrol – to sniff the lampposts in their neighbourhood and see who has left their calling card. For that they need to be able to stop from time to time, and trying to keep up with a bicycle doesn’t permit that. The dogs don’t go ‘walkies’ going somewhere alongside a bike, just as they don’t go ‘walkies’ when going somewhere in a car or in a bus. 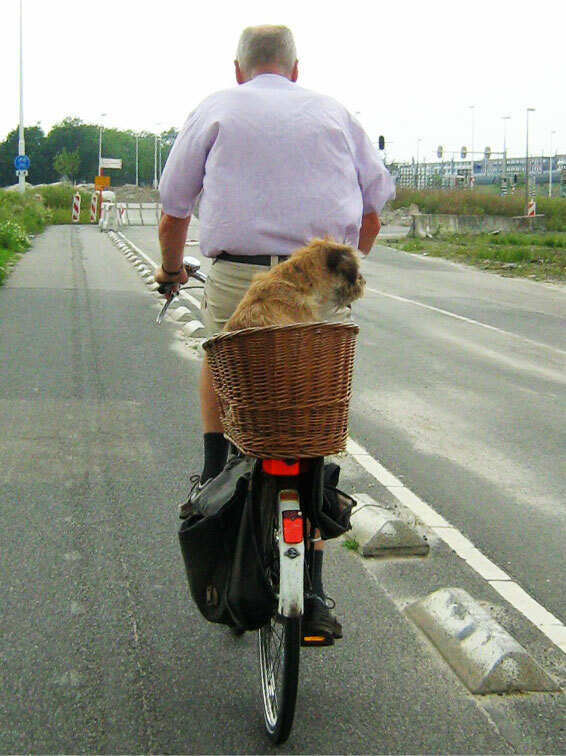 The bicycle is a mode of transport, and small dogs can be transported in a basket, but larger ones have to run alongside, and I happen to think (judging from the wagging tails I see) that dogs find running aside their owner on an ambling bike much more to their liking and their natural instincts than being locked up in a moving bulk of metal. When I lived in Godalming there was a chap who regularly cycled a mile or so between there and Farncombe (on the road of course, there are only a few cyclepaths in Surrey and all bad) with a dog – no lead – that kept exact position with him on the adjacent pavement. He would pause at side roads if there was a car about to emerge or turn in and the dog stopped and sat too, moving off with perfect sychronicity as the rider did, all without his uttering a single audible word of command. I don’t think that guy had much to learn from any dog trainer. Interesting point which I hadn’t considered! Not being a dog owner, I’m not really qualified to comment, but the dogs did look really happy trotting alongside their owner. Maybe they sniff the lamp-posts around their house, and the bike runs are further afield? As a cat, I’d much rather be inside having a snooze, any day! There are two types of front racks: the ones connected to the frame, and the ones connected to the wheel (rotating while steering). His bike has the second, more common type. However, for heavy loads, this is quite uncomfortable, since it will affect steering. A crate of beer on the back rack is much easier to navigate. I saw ‘the Dog Whisperer’ the other day. I it, Cesar Milan explained that human walking pace is often way too slow for a lot of dogs, which need the exercise. He likes to take his rollerskates himself, but a bike would do just as well, I think. But Paul’s point that dogs like to sniff out their surroundings is a very good one. I think dogs still need to be taken for a walk as well, if only for sanitary reasons. I have a Trixie bike lead for transporting my dog short distances (he is looked after by my mum who lives two miles away while I’m at work). He seems to enjoy trotting along side me, but I don’t use this to replace his walk – we both consider going out on patrol in the local woods the highlight of our day!